Civil Society Organizations (CSOs) operating in the Northern Region have declared their unflinching support towards the implementation of the road map peace in Dagbon. The CSOs led by the Northern Ghana Network for Development (NGND) and the Dagbon Forum (DF) has formed a consortium to press home the need for everyone to embrace peace. A joint statement issued in Tamale by NGND and DF, called on both international and local donor agencies to support the peace process in any way they can. The statement signed by the DF National President, Dr Sulemana Abudulai, Mr Theophilus Dokurigu Alhassan, Executive Director, Northern Ghana Network for Development pledged to create a platform for monitoring, responding, designing and implementing early warning systems to prevent potential threats to the Road Map. The group pledged to create a platform for monitoring, responding, designing and implementing early warning systems to prevent potential threats to the Road Map. They applauded the work of the Three Eminent Kings aimed at bringing normalcy back to Dagbon, and urged all well-meaning Dagbamba to support the proposed Road Map. All legal and administrative arrangements related to the Road Map should be completed and publicized without delay to avoid misinformation and misinterpretation, the statement pleaded. It urged families and sympathizers on both sides to think of the wider and longer-term interest of Dagbon and encouraged all parties to commit unconditionally to the Roadmap. The statement also urged the public to depoliticize the Road Map and contribute to peace and stability. Civil society actors and religious leaders it said should come out with clear peace building and conflict prevention messages in the lead up to the performance of the two funerals. On the role of the media, the statement appealed to media houses to exercise maximum restraint in carrying stories about the Roadmap and also discourage live phone-in discussions on the matter. The peace process the observed should go beyond the enskinment of a substantive Yaa-Naa in order to strengthen and sustain the required peace in Dagbon. It appealed to all Dagbamba to support and proudly participate in the performance of the funerals of the late two Overlords, Yaa-Naa Mahamadu Abdulai IV and Yaa-Naa Yakubu Andani II and the enskinment of a substantive Yaa-Naa. 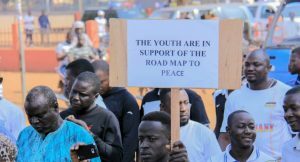 The statement in conclusion urged the general public to serve as peace ambassadors by exposing persons and groups of individuals whose actions are likely to thwart the implementation of the road map to peace in Dagbon.